As an alternative to means of entrance, a Patio slider has always been a popular choice. The smooth sliding operating system makes effortless work of opening up and the stylish appearance looks good and will stay looking good. Manufactured as standard in White Shield 70mm, our Two Pane Patio Slider comes with internal glazing for added security. High grade locking with its stainless steel lock hooks and keeps, plus anti-lift blocks, work as a secure unit preventing the door from being lifted out of the frame. Available in Light Oak, Mahogany or Cherry woodgrains. The combination of a bevelled profile bead provide a stylish and elegant finish to complement any home. With an In-Line Sliding Patio Door, you can bring the outside in, making your room feel brighter and bigger. Our patio doors in uPVC or aluminium look great from any vantage point - inside or out - bringing a feeling of big, wide open space to enhance almost any style of property. With easy-glide panels and a low threshold, a James and Co. (Midlands) Ltd. patio door makes it so simple for you to step out into your garden or onto your balcony, to enjoy the fresh air - and relax. Our patio doors are tailor-made to suit your home, available as two, three or four panels, they'll slide open and closed effortlessly for years to come. 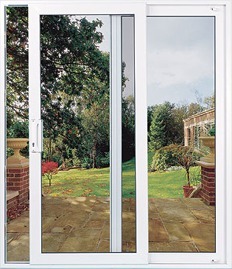 Both uPVC and aluminium patio doors feature toughened safety glass as standard.